Hendre North lies in the community of Cilcain in the county of Flintshire. It is located at Ordnance Survey national grid reference SJ19306820. The mine is recorded in the CPAT Historic Environment Record as number 18099 and this number should be quoted in all correspondence. Hendre East was apparently operating in the Halkyn area 1869-77, with no detailed returns and no NGR given in Burt et al (1993, 46). The Hendre South Mining Company operating 1869-71, with no detailed returns and no NGR (Burt et al 1993, 48) was probably working in the south of the valley at SJ18806760. Hendre Figallt (Villt) appears as a single shaft on OS 1st edition 1869-70 map Sheet 1X.14 generally working the same sett as North Hendre. Hendre Ucha is referenced as operating in the Rhydymwyn area 1861-66 (Burt et al 1993, 46) but no NGR given. The Coed Hendre Vein runs north of the Hendre Valley and the later large North Hendre Company worked the sett to the south of the Bryngwiog Mine. The working evidence has been lost to the present Quarry. 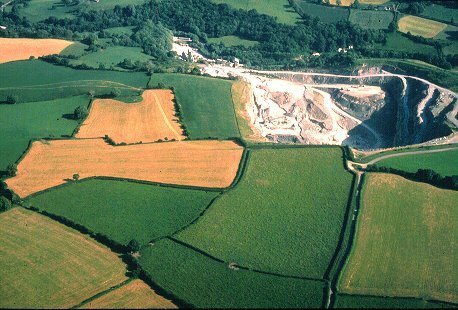 The shafts that remain in the vicinity of Cilcen Hall and Fron Farm were part of the later North Hendre Mine sett as was Hendre Figallt, now lost to Quarrying. Bromleys' shaft remains to the south-east of Cilcen Hall, but the old engine shaft and the No 2 shaft have been lost to quarrying.